I don't see Bobby's book on iTunes. Or Google Play. Or Nook. Only Amazon. How can I access it? For about a year, we have been experimenting with participation in Amazon's Kindle Unlimited Program, which allows readers to pay for a subscription that allows them to read "unlimited" books for a flat monthly fee. In the past, we have published to all major platforms—iTunes, Google Play, Nook, Kobo, and Amazon. However, many of Bobby's books are now included in Kindle Unlimited. Some of the advantages are the ability to let users download books directly to their Kindle App on devices other than an Amazon Kindle, but you can still download even if you're not participating in KU. However, when books are in the Kindle Unlimited program, Amazon demands exclusivity on the content, and requires that authors and publishers remove their content from competitors' sites. I have a lot more I could say about that, but since Bobby is a full-time writer and we depend on a good relationship with Amazon. I'll bite my tongue. So to read my books that are included in KU, the main question is this—does your device have access to a store where you can download the Kindle App? We studied the device usage of readers for several years and determined the majority were using iPad, iPhone, Kindle, and Android devices, which are all able to access the content or download the Kindle App. A small number of readers had Nook devices, but most were the newer Android-based ones. To our knowledge, only two or three readers had Kobo eReaders (not the Kobo app on another device, the actual hardware). If your device is not supported, I apologize for the inconvenience. I hope someday that we move past this fragmented marketplace and everything just works. And remember, you can always use your smartphone as an eReader, and the Kindle App is available on all of them, to my knowledge. I hope the information below is helpful. Apple users can access content through the Kindle App on the iPad. If you're a member of Kindle Unlimited, you can download directly through the Kindle App. If you are not a member, you can open Safari or Chrome, purchase a book with 1-Click on Amazon, then it should automatically download to your device when you launch the Kindle App. Click here to access the Kindle App from the iTunes Store. Android users can access content through the Kindle App from the Google Play Store. We don't have access to an Android device, but believe that if you are a member of Kindle Unlimited that you can download directly through the Kindle App. If you are an Android user, and you have better knowledge of this, please let us know. Here is a link to access the Kindle App from the Google Play Store. There are different models of Nooks...the original "paper" eReader type of Nook, and the newer Nooks that are Samsung hardware running the Android OS. 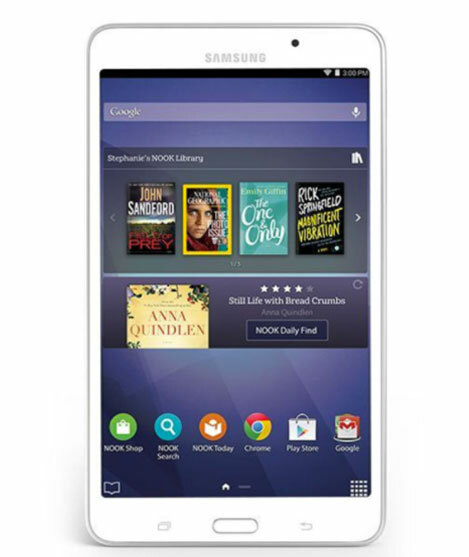 With the newer Samsung Nooks, download the Kindle App from the device's store or the Google Play Store. Unfortunately, if you have an older Nook, there is not an option to purchase and view the book while the book is in the Kindle Unlimited program. Perhaps try reading on your smartphone? The Kobo eReader is proprietary and not able to view Kindle or Kindle Unlimited content. I would assume that one could download and view Kindle content from the Kindle App for Windows Phone. I found a Kindle App for Windows Phone here.